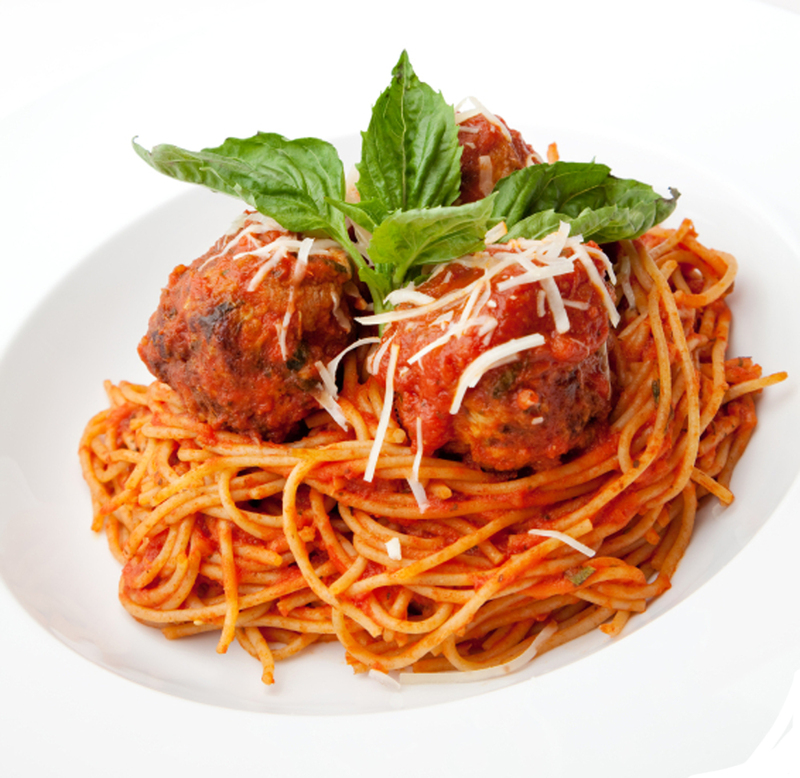 As with everything we make, the trick to a sublime bowl of spaghetti and meatballs is using the best quality ingredients. It is always preferable to have the butcher grind fresh chuck instead of buying packaged ground beef. 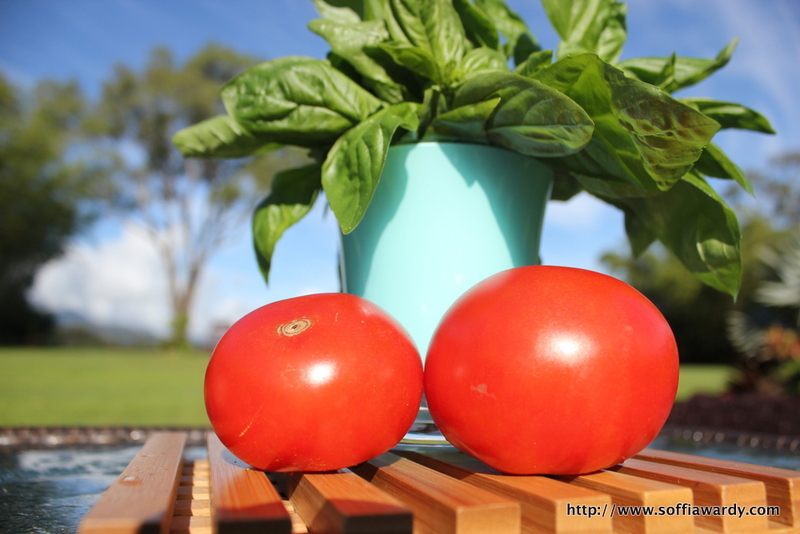 Same goes for grating aged Pecorino Romano, using fresh basil and San Marzano tomatoes. 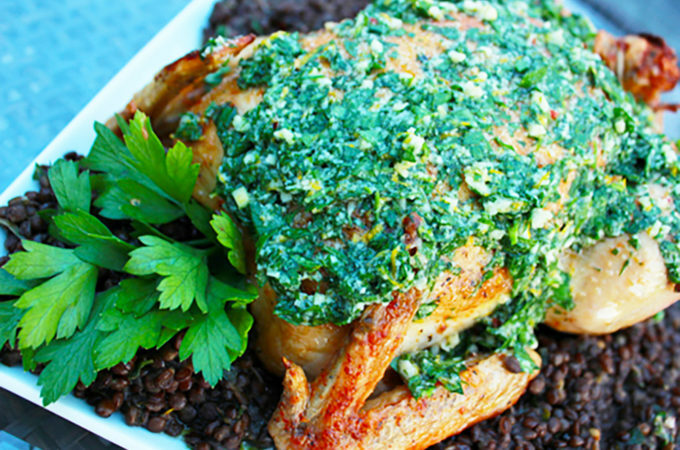 We fist saw this recipe on Bobby Flay’s Throwdown and thought we’d give it a try. All I can say is now I miss Grandma Maroni almost as I miss my Grandmother. These meatballs are almost fluffy and much lighter than many others we have tried to make. 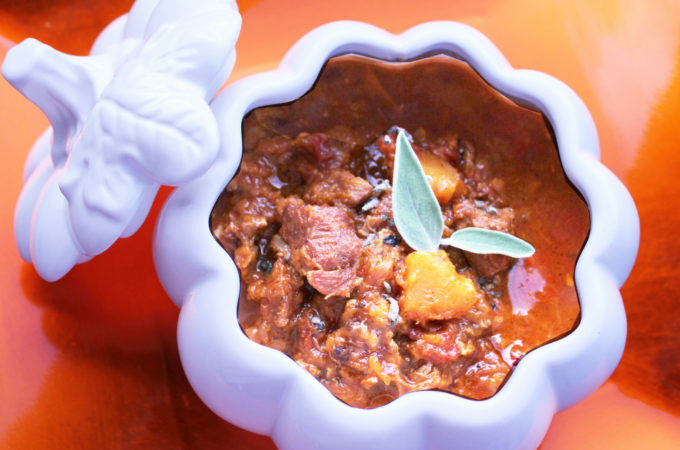 You can also mix pork and veal with the beef to a 1 pound ratio of all three included for a flavor variation. We decided to make extra meatballs for a cocktail party, so those photographed on the tray are actually much smaller than the meatballs we made and served with the spaghetti. Lightly coat a baking sheet with olive oil or nonstick cooking spray; set aside. Mix all ingredients thoroughly but carefully in large bowl. If mixture seems a little loose add more bread crumbs. 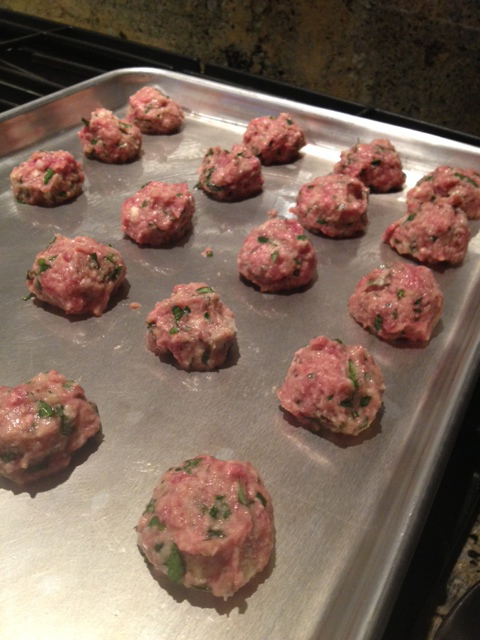 Roll meatballs loosely about the size of a golf ball and place on a baking sheet. Place into preheated oven and bake for approximately 20-25 minutes, set aside. In a medium saucepan over medium heat, add oil. Once heated add the finely sliced garlic and stir. Then add the onions to the pan and sweat. Next add the canned crushed tomatoes, salt and pepper and stir. Allow the sauce to come to a simmer and cook for about 15 minutes. Remove from the heat and add the julienned basil and set aside. Cook according to package directions drain and set aside. Heat sauce in a medium pot over medium heat. Transfer meatballs to the sauce and cook for at least 15 minutes, reduce the heat to low. Transfer 4 ladles of sauce from the pot to a medium sauce pan over medium heat. Add drained spaghetti, grated Pecorino Romano and fresh chopped basil, toss to combine. 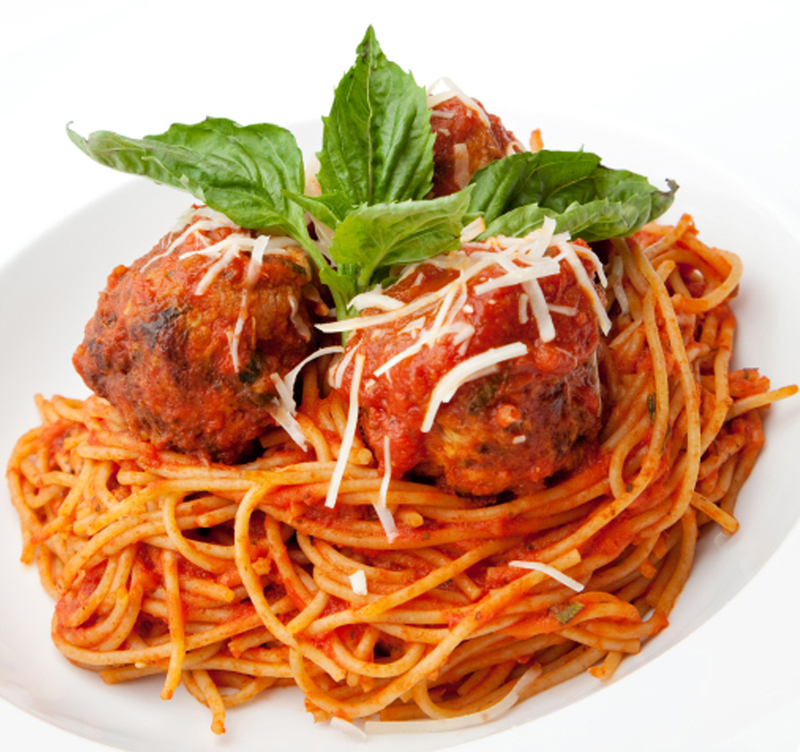 This is hands down the all time BEST spaghetti and meatballs recipe I’ve ever made!! It’s my most requested meal and I’ll usually make 2 portions of the sauce and meatballs so i have enough to freeze half for another meal a few weeks later. But honestly, one portion alone is enough for 2 dinners for me and my wand even 3 if we have the spaghetti and meatballs 2 nights and meatball sandwiches for lunch or dinner another day. The meatball sandwiches are just to die for and all you need do is heat up the meatballs and then the sauce, separately in the microwave and then place the meatballs on a really good sandwich roll, then cover them with a good amount of the sauce and I put some shredded mozzarella cheese on too and then just pop your sandwich in the microwave for about 30-45 seconds, until the cheese is sufficiently melted, and then sit down and get ready to eat the best meatball sandwich you’ve ever had in your life! My only suggestion when cooking the meatballs is to be sure to coat the pan (I use a cookie sheet pan) with an olive oil spray or you can also use non-stick foil or parchment paper so they don’t stick to the pan, but I prefer the olive oil spray myself I just use a spatula to remove them from the pan. Other than that, I follow the exact recipe and they com out perfectly. I originally found this recipe on an episode of Throwdown With Bobby Flay and the recipe was from the owner of Maroni Cuisine in Northport, New York, and on this particular episode, they showed how on any given day, there’s a line, at least 30 deep, of people waiting to pick up the meatballs and sauce to go. And I plan on eating at this restaurant at least once, and definitely on my first day visiting New York, on my next trip there!! Thank you so much for your comment and ideas, love the meatball sandwich! So glad you enjoyed this post.